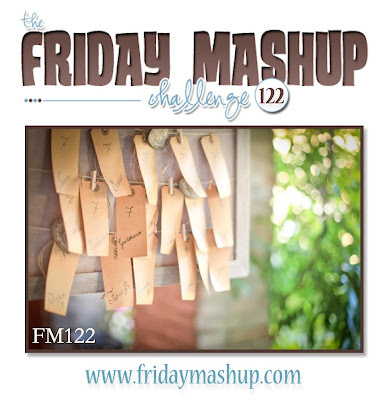 I’m a little late posting the Friday Mashup challenge again. Things have just been crazy insane busy here both at work and at home. I think I went a little crazy with my grunge on this one, but I had so much fun! Create a project with a "Tag (as an embellishment on you rproject or as the project itself )." Create a project using the colors "Crisp Cantaloupe, Soft Sky, Primrose Petals & Bermuda Bay". Ok so here’s how it’s done. Cut a piece of Coastal Cabana card stock 5-1/2” x 8-1/2” and score it at 4-1/4”. Stamp the large and medium splatter images all over the card stock in Coastal Cabana ink. Now cut a piece of Smoky Slate chevron DSP 2” x 4”. Stamp the DSP with the smaller splatter image in Coastal Cabana ink. Then stamp the large stamp with the small splatter dots in silver ink with your Silver Encore pad. Adhere this onto the left side of the card front. Cut a piece of Silver Glimmer Paper 1/4” x 5-1/4” and adhere it right next to the DSP. 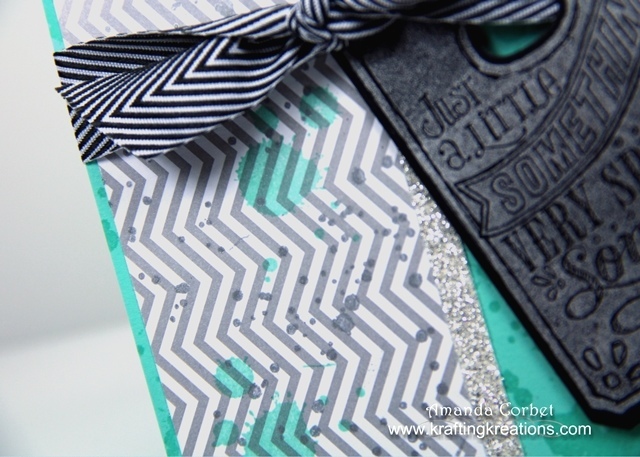 With this glimmer paper just a little goes a long way and adds LOTS of shimmer! 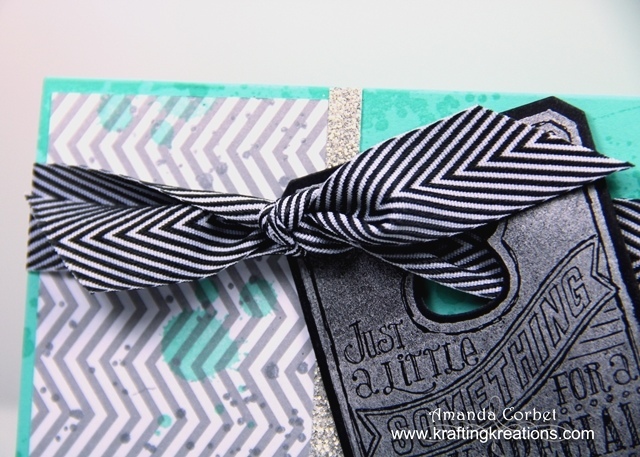 Next cut a piece of Basic Black Chevron ribbon, wrap it around the card front, and tie it into a knot. Trim those ribbon ends so they look pretty. Next stamp the large image from the Chalk Talk stamp set onto a scrap of Basic Black card stock in Silver Encore ink. Use the Chalk Talk framelits to cut out the shape and adhere the tag onto the card front with some Stampin’ Dimensionals. Super quick and easy with lots of sparkle!